Nobody likes clipping black claws and Griffons unfortunately have them! It’s especially embarrassing for a vet to clip a claw and have the unfortunate dog yelp in pain and then see blood dripping onto the consult table and still look professional whilst you rummage in the cabinet looking for styptic powder. Even with over 25 years experience I still regularly cut black claws too short and cut into the quick and I wish that the client would instead just get a professional dog bather and groomer to do the claws and leave me to do the more important things! So, for what it’s worth, here is my advice on clipping claws and some alternatives. Firstly you might need a quick refresher about the anatomy of the dog’s claw which is simple, they are exactly the same as our toenails except their toenail is called a claw and their nail bed is called a ‘quick’. Whilst our nail beds are fairly flat and so our nails will also grow out relatively flat from the nail bed, our dog’s quicks are peg or conical in shape and hence the shape of their claw. The problem is that their quick protrudes beyond the end of their digit, while ours don’t. The other nuisance is that if we allow their claws to become fairly long, we find that their quicks will become longer as well. This means that many clients are disappointed when vets can only clip a relatively short amount off very long claws. However, if we clip the claw fairly close to the quick and keep doing so regularly, we find that the quick will regress away from the claw tip and eventually the claws can be a manageable length again and not curling under the pad. If the claw is white or even just a little lighter than black, you may clearly see the quick and so position the claw cutter in front of the quick and cut at an angle shown in the diagram below which is roughly at a right angle to the claw. One trick I use is to position a pen torch so that it is shining through the claw and so you’ll clearly see the pink quick silhouetted against the light from the torch. Don’t cut any closer than 2mm from the pink quick that you are visualizing. This doesn’t work with our Griffon’s black claws!! Another hint to see where it is safe to cut with black claws is to look at and feel the underneath of the claw. You’ll notice with claws that are too long that at the end of the claw it will be hollowed out underneath. The hollowed out area represents the space that the quick once occupied but is now ‘empty’ as the claw has continued to grow out from the quick. This hollowed out portion of the claw will often give the claw a slightly tapered appearance when seen from the side on view. So, position the claw cutters a little past the beginning of the hollowed out area at the same angle in the diagram and gently squeeze. I always try to squeeze the claw a little first because if the cutters are over the quick then the dog will usually tell you that it is uncomfortable, and so you can release the cutters and try a little further away down the claw. If the dog isn’t reacting too much as you squeeze then go ahead and cut through the claw. 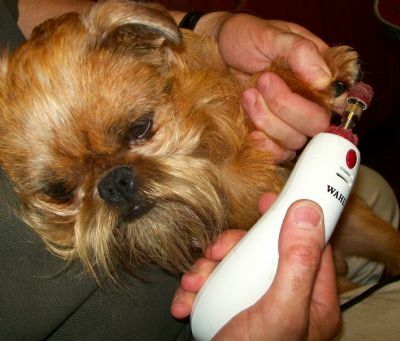 Of course, some dogs just go bananas if you even show them the claw clippers and so the gentle squeeze might still elicit screams of abuse and you aren’t actually anywhere near the quick! 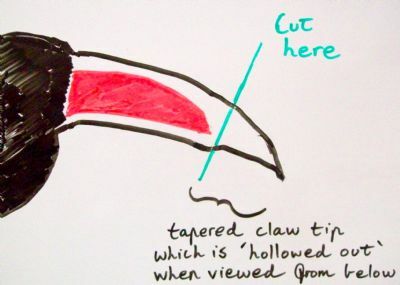 If there is no appreciable hollowed out tip to the claw and no appreciable tapering of the claw when viewed side on and the claw is black in colour, then I wouldn’t bother trying to clip it! If you have clipped the claw and are wondering if you could cut alittle more off then another tip is to take a look at the cut claw tip. If you can see a pale gray or even pink homogenous area of tissue in the middle of the claw cross section where you have cut then don’t cut any further. This is the tissue that surrounds the actual blood vessels of the quick. Don’t think that the back claws will need a similar length of claw cut away to that of the front claws. Usually the back claws will be naturally shorter and will need less cut away, if any, compared to the front claws. Dogs propel themselves more from the back paws, which is why they are usually more worn. Don’t forget to clip the dew claws if they are present. I recommend scissor like claw cutters rather than the guillotine style clippers (see pictured). If you use guillotine clippers, make sure the blade isn’t loose and have the beveled cutting blade facing you rather than facing the paw. 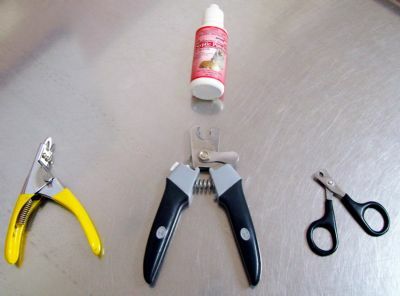 Many scissor type claw cutters have a guard, which is designed to minimize the chance of cutting the quick if the guard positioned so that it is flush against the claw tip. This doesn’t always work and so be prepared that you may need to leave a space between the guard and the end of the claw when cutting. Bleeding claws. If you are unlucky and you do cut through the quick then have some styptic powder handy. This powder can be pushed into the bleeding claw tip with your fingertip and usually works well. Styptic powder can be purchased from most dog grooming product stockists. Another trick is to use corn flour in a similar way or use a wet cake of soap and push the claw tip into the soap in order to push some soap into the quick and so block off the blood vessel, but styptic powder works best. Don’t use soldering irons! This is cruel and can permanently damage the quick and result in sloughing of the claw. Nail files and grinders. An alternative to cutting claws is using a dog nail file, which has a ‘U’ shape in cross section. Just pull the file along the claw tips regularly to gradually shorten the claw. Even better is to use electric claw grinders that are available from many grooming supply stores and stockists. I use a Wahl pet nail grinder that has different tips for coarsely grinding a very long claw and finer ones for leaving a smooth polished finish to the claw. When using these grinders be careful to only do short bursts of grinding, as it is easy to overheat the claw, which is quite painful to the dog, and check regularly that you aren’t encroaching onto the quick where you will see the appearance of that pale grey or pink soft tissue appearing inside the claw tip. It is time to stop grinding if you see this and definitely time to stop if blood is appearing on the grinding tip. above, Ned loves having his claws grinded! Sometimes when grinding very long claws, you’ll get to a stage where you can’t safely grind the claw without the grinder damaging the toe or pad, yet there is still a spur of claw digging into the bottom of the pad. 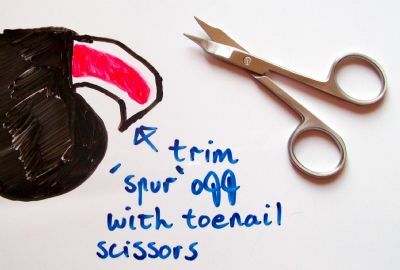 This is where I use a human scissor style toenail clipper to trim off the spur (see below). We should all regularly trim / scissor excess fur away from the sides of the pads and fur that is protruding from between the pads and between the toes. This fur is not only a magnet for grasseeds, but can also form matts that can cause irritation and result in moist infections (pododermatitis). Many dogs with wet muddy encrusted fur matts are seen especially in the wetter months while grassed abscesses which occur usually between the toes are seen in the warmer months. Beware of walking your dog for unaccustomed distances on harsh footpaths and roads especially in summertime. Their footpads can easily become too worn, abraded and even burnt under these conditions resulting in painful cracks, moist abrasions and infections. Mildly abraded and sore pads can be treated with products such as Paw Paw lotion, sorbolene and even Vaseline. Other products that can be massaged into sore pads that seem to be more easily found on the internet include, Musher’s Secret, SurfDog Soothing Wax, Tuf-Foot amongst others. Assuming that the pads aren’t infected but are soft or mildly abraded and need to be toughened and protected then the above products like Musher’s secret, Surfdog, Tuf-foot are useful. An old veterinary remedy is to wet the pads daily with methlylated spirits, which will often toughen up the pads. Don’t use metho if the pads have moist abrasions or lacerations! Friar’s balsam, if you can find it, is useful to apply as a protective coating to soft pads. So, if the foot is bleeding after an injury such as being cut by glass, then rinse thoroughly with cold water and then use dressing material, gauze or cotton wool to apply pressure to stem the bleeding. A small laceration might require bandaging overnight but your vet should see and treat a more severe wound. Otherwise treatments as those discussed above can be tried. A dog that is excessively licking between the toes might have an interdigital abscess. You’ll usually see a swelling and even a discharging sinus, sometimes even a grass seed protruding from it if you catch it early enough. Your vet may need to explore these for foreign bodies before or after trying a poultice dressing. Good luck but remember that I recommended going to a dog groomer first to cut your Griffon’s claws!